I can’t claim to have green fingers. In fact, every plant I touch seems to take offence and wither! That doesn’t mean that I don’t appreciate the beauty that a colourful bloom can provide however. I value the welcome burst of colour in what might otherwise be a somewhat dreary sea of green foliage. The fact that I’m no gardener doesn’t mean that my garden has no flowers. Some seem quite capable of growing without any help, but, without interaction they run the risk of being overtaken by weeds, or simply failing to live up to their potential. The longevity and overall success largely comes down to someone taking an active interest, or a passive interest. The same can be said about training and education. It is true that even the most passive environment will result in someone learning something, although much of what that person will pick up might be inaccurate or inappropriate. There is a wealth of evidence to support the view that taking an active stance is beneficial, but we don’t need to trawl through academic journals to reach that conclusion, it is intuitive and logical. An American educationalist, Edgar Dale, developed the ‘Cone of Experience’, also known as the ‘Learning Triangle’ in the 1940s/50s. In recent years the research has been disputed as the original data was not recorded, however, even if we disbelieve the percentages used, common sense tells us it’s generally right. 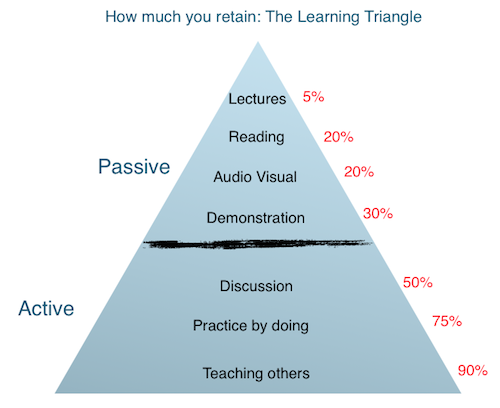 So what are the differences between 'active' and 'passive' learning? If your course has a passive approach, then your learners will reflect that passivity. For example, if you assume that learners will turn up, or log on, with a sponge-like mind, ready to be filled as you pour knowledge out at them, rather like an empty glass being held under a running tap, then they are likely to become frustrated as their capacity to retain information quickly diminishes. On the other hand if you create an environment that encourages the learner to develop ideas from new information and to take advantage of their existing understanding around a topic then you have created an active environment. From the learner's point of view, a passive attitude would be exemplified by an expectation that the course leader has ‘total knowledge’ and therefore anyone with ‘total knowledge’ can teach others. This is a very dangerous assumption! In the play Man and Superman, George Bernard Shaw coined the derisory phrase, “those who can, do; those who can’t, teach”. It’s a classic passive aggressive viewpoint. A more active approach acknowledges that a course leader has certain knowledge and that they give thought as to how to present that knowledge in a meaningful manner that guides the learner without necessarily providing the actual answers. In this way the learner is expected to use the framework provided to find examples and then to lean on the course leader as a mentor figure to develop a reflective, potentially even discursive, approach in order to broaden the overall understanding of the topic in question. E-Learning is often self-paced and self-directed. Does it follow that it is therefore passive? Not necessarily so. It would be a mistake to view training and particularly online training as a way of being able to commit less time (human capital) to obtain great leverage from the scale opportunity. Instead, careful thought should be given to the topics to identify where a more passive or active approach is required. Writing course material with rhetorical questions and inviting learners to perform research and to post findings to their Learning Line (using the I Learnt This! button) is an example of an active approach. Equally, finding mentors to support the studies can introduce valuable activity, which is why we’d like to invite you to view our guide to mentoring on the Learning Line. Your Industry Needs You!